Specialties: Bridal, Portrait, Fashion & Glamour Makeup & Hair. Has also provided salon hair services. Greer based, but available for travel. 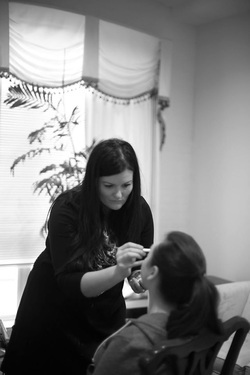 Erica joined our team in the spring of 2016 after she moved to the upstate from Chicago where she had an established bridal makeup and hair business. After her talent was mentioned to company owner by a dear friend, we contacted Erica and invited her to team. She was delighted to get her hands back into the world of bridal makeup and hair and quickly began bookings as a lead artist! Don't let Erica's strength in dramatic makeup stir you! She's one of the most soft spoken and sweetest artists you will ever meet! And yes while she is fantastic at a more glamorous look, she can still give you the subtle natural glow that many brides are after.